Transforming your daily performance from sluggish to quota busting success is achievable. Utilizing proven techniques and strategies that change your game, injecting fresh ideas and habits into your daily routine is all it takes. The first habit that will reward you with results begins with examining the structure of your day. If you think about your daily routine, perhaps there is something you are doing that’s holding you back. Are you waiting too long to return calls? Do you hesitate or not have all the information you need to provide answers to questions? Take the time to revisit what you’re doing. Decide on a few things you could change (replace with new habits) that will improve your sales efforts. Keeping yourself educated and informed about what you are actually doing will allow you to make proactive decisions that are sure to boost your potential. Always seek out new leads whenever you can. Create new strategies and try new things while prospecting to keep yourself engaged with your work. Strong, simple, interactive and informative pitch strategies are what makes a winning connection. Start asking questions to help you learn how to develop a better pitch. Ask them what they are looking for so you can find the way in to assure them that your product is what they need. Kill two birds with one stone and ask your current customers what they like about your product and service and what you could improve. Develop this information into a stellar sales pitch! Also, ask the client for referrals if the timing seems right and they are giving you the positive feedback you were looking for. Remember, switch up your pitch to engage your prospects in new ways. Look for ways to motivate the sale. Meet a client for coffee at their favorite shop. Get to know your customers and cater to them. It can make all the difference between their not being able to fit you into their busy schedule and enjoying your sales pitch over coffee. People often forget to do the research necessary to truly make them look like a professional. If you’re coming up short with answers to objections, do some quality fact checking. Learn more about how customer objections can be countered with strong, friendly rebuttals and strengthen your sale potential. Ask your co-workers and/or bosses what strategies have worked for them while dealing with rejections. Consult a sales coach and learn proven methods of dealing with rejection. When you have confidence in the product you are selling and the facts to back it up, you’ll present a winning sales pitch. Ensure sincerity is at the core of your conversations; this will build trust and loyalty in your brand. Finally, do not forget to research the company and person you are pitching to. This will build even more trust and a personal connection that will improve your chances of making the sale compared to your competitors. The fourth habit that will help to improve the results related to your sales efforts is to observe the work habits of the winning sellers on your team. If you are just noticing your co-worker in the corner cubicle who arrives early every day and stays late, maybe they are on to something. There’s something to be learned from someone willing to go the extra distance to win the customer over. The fifth and final performance based sales habit to learn is recognizing that just making the call isn’t enough. Keeping detailed records of your interaction can lead to another opportunity. Jotting down notes that describe your encounter is a great habit that you need to develop. Perhaps you caught them on their way out. Bad timing isn’t always a lost sale. Perhaps they’ve mentioned a decline in profits, and they’re not in a financial position to buy. Note that in your records and follow up on how things are doing. When you follow up, you will have detailed notes to make you look caring and help them remember you. Learning about potential customers is good business practice all around, and it can boost sales. 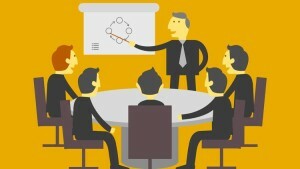 Learn how to present a sales proposal like a boss! Work on developing these performance-based sales habits to ensure you meet your sales numbers. If you need additional help, reach out to The Sales Coaching Institute for Sales Training or One-on-One Sales Coaching. We also offer Sales Force Audits & Assessments.